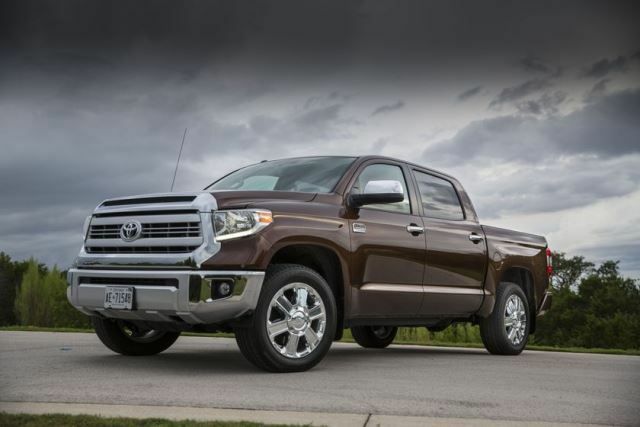 TORONTO, ON., (November 4, 2014) – The Toyota Tundra will be prominently featured in November at two of Western Canada’s most important agricultural events – Agri-trade in Red Deer and Agribition in Regina. Agri-trade, the annual agriculture and lifestyle show with a focus on farm equipment and services, runs from November 5-8 at Westerner Park. Toyota will be in Booth AGE 1020, in the Truck & Trailer Pavilion at Agricentre East. Later in the month, from November 24-29, Toyota will have a booth at Agribition, the largest livestock show in Canada. Toyota will be in booth 746 at Credit Union Eventplex. Tundra will both be on display and available to visitors for test drives at Toyota’s Agri-trade and Agribition booths. Guests will be able to gain an appreciation for how Tundra is a bold and distinctive full-size pickup that offers real-world fuel efficiency and reliability. In addition, Jamie Davis of Discovery’s television series “Highway Thru Hell” will be at Toyota’s booth to attest to the capability of the Tundra under the most adverse weather and terrain conditions. Thursday, November 6 (Agri-trade): 10:00–11:30 a.m. and 1:30–3:00 p.m.
Wednesday, November 26 (Agribition): 1:30–3:00 p.m. and 4:30–6:00 p.m.
Thursday, November 27 (Agribition): 1:30–3:00 p.m. and 4:30–6:00 p.m.
Davis’ show, chronicles the heavy rescue work his crew undertakes in patrolling some of the world’s most dangerous and difficult stretches of road. That includes the highways of the Coquihalla and Fraser Canyon in British Columbia, as well as Highways 63 and 881 that lead to Fort McMurray, Alberta. Davis and his colleagues rely on four Tundra vehicles to meet the challenges of their job. Much of Toyota’s 2015 lineup of cars and trucks will be on display at both events. That includes the new 2015 Camry – North America’s best-selling passenger car – which will be available for test drives.